Emily: Is everybody gay? Is this a Twilight Zone? Light at heart for subject and comedy. 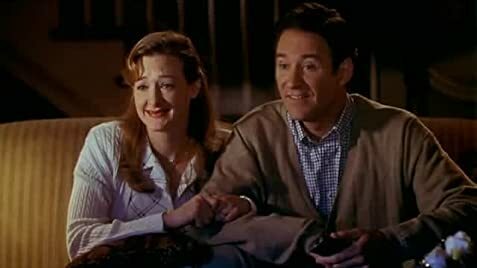 Frank Oz has done a wonderful job in directing this comedy that, for the 90s, is one notch above average. I believe the nineties was a gay decade (I have never seen so much publicity before it), and here comes a charming, sometimes funny view about it. Mind you, the main idea really came from Tom Hanks' acceptance speech, where after winning the Academy Award for Philadelphia, he thanked his gay drama teacher. So imagine an English teacher, who loves sonnets and is getting married in three days, getting the same treatment. It's a good set up. After being awarded an Oscar for the portrayal of a gay soldier, Cameron Drake thanks his English teacher for being his gay inspiration. Problem is, he's not. The way Kline tackles sexual preference is also how one would confront the ending of a relationship, which could be what this movie is about on a smaller level. Denial, anger, experimentation ... it's a much more thoughtful movie than others. Everyone gets a happy ending here on some level. Between the bachelor party and the masculinity assessment, I have to choose the guy's night out as the funniest part in the film. 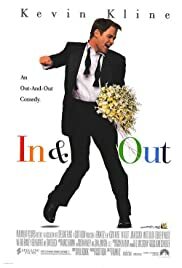 In & Out is a good movie and I would recommend it if you were curious.